Two cold spells, two years apart, in two subtropical regions of the world have given scientists clues to what happens when an extreme climate event strikes. By tracking conditions before, during and after a 2008 cold spell in China and a 2010 cold spell in Florida, FIU researchers found chilling effects on plants and animals, but not all were equal. Tropical species suffered more than their temperate counterparts, which were able to resist and recover from the record low temperatures. 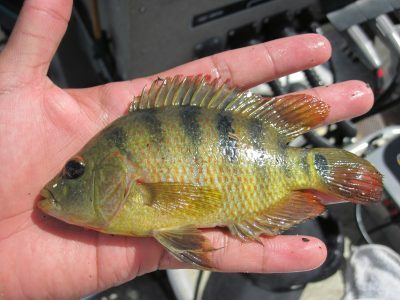 Non-native Mayan cichlid, one of the tropical species that suffered a major decline due to the extreme 2010 cold snap. Photo by Jennifer Rehage, Florida International University. In South Florida, tropical fish populations declined while the populations of their temperate counterparts remained unchanged or increased following the 2010 cold spell. Tropical American crocodiles declined while temperate American alligators weathered the cold, and tropical mangroves died while temperate saltmarsh grasses survived. In China, the population of tropical butterflies in the Nanling National Nature Preserve dropped by 80 percent following the cold spell there, allowing temperate butterflies to dominate the area for two years. The FIU researchers, along with others in the United States and China, have conducted long-term research programs in these two regions, including the FCE LTER program, part of the National Science Foundation’s LTER Network. With historic data in-hand, they were able to act quickly when the cold snaps arrived — evaluating conditions and the local plants and animals long after temperatures returned to normal. Their efforts resulted in 11 studies published in a special feature of Ecosphere. “Tropical species are one of the most sensitive groups of plants and animals to climate warming,” said Ross Boucek, a researcher in the FCE LTER program who earned his Ph.D. from FIU in 2016. Boucek also organized the extreme cold spell special feature. Along with disruptions to biodiversity, the cold spells impacted Florida’s fisheries. Economically lucrative bonefish, snook and goliath grouper experienced mass mortality, while others, including red drum and gray snapper, were not affected. Some of those actually saw population increases after the cold spell passed, including redfish. Non-native species also proved to be less resistant to the cold spells than natives. Non-native bee populations in South Florida took nearly four years to recover and some non-native fish have shown no meaningful population recovery to date. Photos from the 2008 and 2010 cold spell studies are available online.